Cologne, Germany (March 27, 2017) – Sünner Brauerei was the first brewery in Cologne to label their golden-hued, open-fermented, bracingly dry beer under the name of Kölsch. Although the style had been produced in the city for decades, Sünner was the first to call the beer a kölsch. With that one small gesture of marketing, the world soon recognized Sünner Kölsch as the benchmark of the style and the city of Cologne was forever linked to its local beer. Sünner Kölsch is so synonymous with beer in Cologne that servers typically only ask you if you would like a beer – without offering a selection – because Sünner Kölsch is the widely-assumed beer of choice in the city. 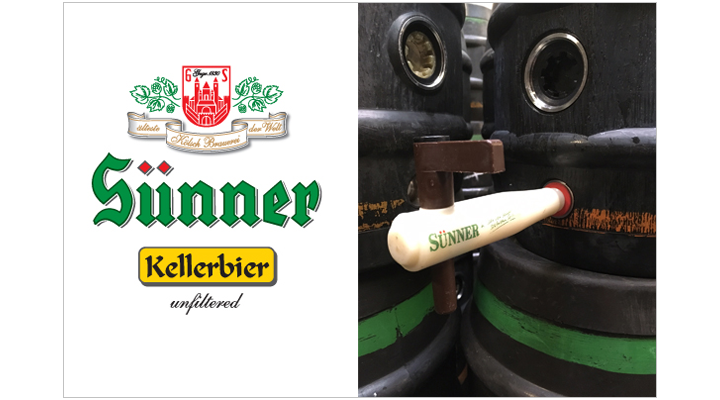 Sünner Brauerei is proud to announce the arrival of its Sünner Kellerbier in April for the U.S. market. Kellerbier is a hazy, unfiltered variant of its Kölsch counterpart. Taken straight from the aging tank of Sünner Kölsch, this 5.3% ABV brew has a more intense flavor than its crystal clear kölsch brother. The yeast in suspension adds a fuller body and complexity, and it displays a thirst-quenching crispness and dry mouthfeel. In terms of flavor, notes of hay, bread and honey are complemented by clean, zippy bitterness. Both Sünner Kellerbier and Sünner Kölsch are served in small, straight-sided glasses called Stange glasses. The small size of the glasses makes it easy to quaff 5, 10 or even 15 Sünner brews as you chat with friends, decompress after a long day or nibble on delicious table snacks. After enjoying a special tasting of Sünner Kellerbier on a recent brewery tour, Artisanal Imports CEO Bob Leggett audaciously asked if the beer could be kegged for the U.S market. Sünner Brauerei agreed and has made it available in tabletop kegs to be served on draft nationwide. Interested in selling Sünner Kellerbier at your restaurant, bar or retail store? Interested in becoming a distribution partner for Sünner Brauerei? Please contact Lanny Hoff with interest. For interview opportunities with Sünner Brauerei marketing manager Christian Hagl, or for more information about Sünner Kellerbier and its historic world-renowned German brewery, please contact Lanny Hoff at +1 (612) 245-5433 or by email at lanny.hoff@artisanalimports.com. About Sünner Brauerei: The oldest brewery in Cologne, Germany, Sünner Brauerei has been family-owned and operated since 1830. Now in its sixth-generation of operation under Astrid Schmitz-DuMont, Sünner remains world-renowned for its continued production of the Kölsch style ale it popularized around the turn of the 20th century, and the exacting specifications it takes to produce some of the world’s cleanest, most crisp and thirst-quenching ales. Learn more about the brewery at www.suenner-brauerei.de/.